It is my belief -- as you’ll find in the book -- that entrepreneurs are actually the best hope for the ongoing prosperity of our planet and culture. One of my passions is enabling and empowering the crucial entrepreneurial personality. 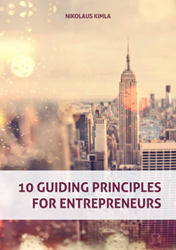 Today, Pipeliner CRM released the 10 Guiding Principles for Entrepreneurs by Nikolaus Kimla, CEO. The book is the latest in a trilogy of titles focused on Entrepreneurial thought leadership. The other two books in the series, Evolution in Progress: How the Entrepreneur Is Changing the World and The Principles of Entrepreneurs, are also available in Pipeliner CRM’s Sales Reference Library. Kimla believes that the most brilliant principles are to be found in the Austrian School of Economic Thought, and have shared some of the most fundamental ones in this book. Entrepreneurs--young, old, brand-new, or seasoned veterans--will benefit from this book. While management is about getting things done, leadership is about creating and cultivating the larger context—the fertile common ground and soil in which things can happen. This book is meant for anyone with a business, whether a startup or successful going concern; these principles apply equally to all. For the novice, they will provide a great and stable foundation. For the more experienced, they can be used them to improved upon practices and processes already in place. This latest eBook release continues Pipeliner’s commitment to provide not only exceptional CRM software, but training and education to help sales managers and salespeople. The company has released several eBooks, white papers, and articles, now available for download. Download the eBook and learn the principles of entrepreneurship or more on Pipeliner CRM software or to download a 30-day free trial, please visit: http://www.pipelinersales.com. Pipeliner CRM is a software system that enables salespeople and teams to understand their sales process and accelerate opportunities toward a close, while saving time and maintaining focus. Pipeliner CRM overlays organizational features atop a visual interface, creating a work tool that adapts to and grows with the organization.